DPS General grade dual layered Polyethersulfone cartridges are custom configured to increase the surface area and give maximum throughputs for general purpose use wherever a cost effective membrane filter is required. Polyethersulfone membrane cartridges priced below special purpose cartridges. Still integrity testable, but with greater dirt holding capacity. Nylon Membrane cartridges capable of removing particles below the pleated pore size of the filter. Low level of extractables and excellent chemical compatibility with solvents. 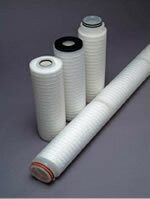 GPM filters lower the cost of chemical/solvent filtration. GPM is often used in place of Teflon Membrane because of lower cost and no undesirable extractables. Typical applications include filtration of aggressive fluids, vent filtration, air and gas filtration. These cartridges are found in the manufacturing processes of Pharmaceutical companies, semi-conductor manufacturers and bulk chemical companies. WPS water grade Polyethersulfone cartridges are designed for general water purpose use, wherever a cost effective membrane filter is required. WPS cartridges are flushed with 17+ megohm-cm water to remove potential extraneous manufacturing debris. Priced below general purpose cartridges, WPS cartridges are still manufactured with the same careful attention to both quality and performance. Fiber glass depth media cartridges flushed to remove manufacturing debris and individually integrity tested. Used in food, water and biological applications where heavy contamination loads plug other types of filters and maximum retention is required. Designed to hold the maximum amount of filter media that can be completely and effectively utilized in a cartridge, these filters lower the cost of filtration. These cartridges are flushed with 17+ meg ohm-cm water to remove potential extraneous manufacturing debris. These cartridge modules are also individually tested. CPD Pleated polypropylene depth cartridges are designed for clarifying applications requiring high flow capacity. The depth media utilized in the CPD product line is high loft Melt-blown polypropylene which gives exceptional flow characterisitics and high dirt holding capacity because of its high internal porosity. files require Adobe Acrobat Reader.